Wow, has it really been a month since this race happened?! 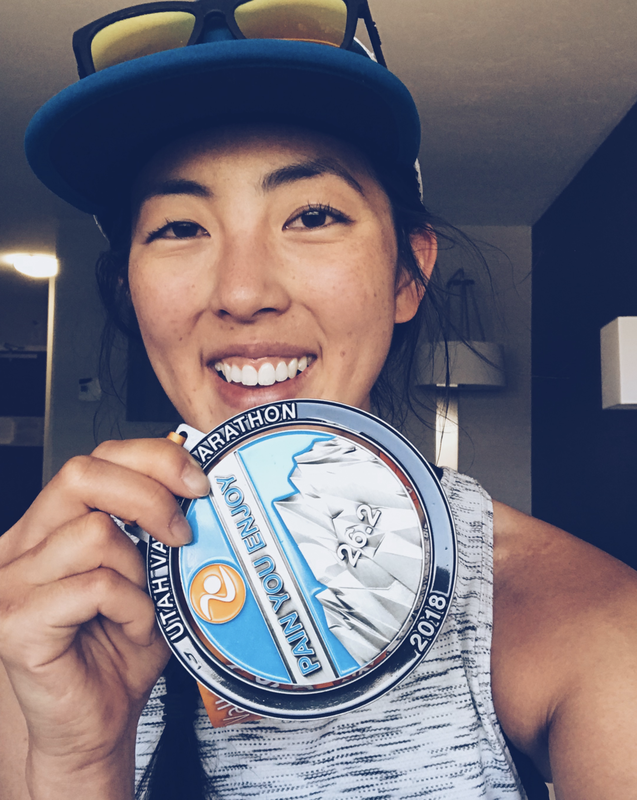 A lot has been going on lately and I've been getting really behind with these race updates, but I wanted to share a quick recap on how the Timp Half went (short answer: it was amazing!). I had signed up for this race solo and so far in advance that I almost forgot about it until I started getting reminder emails less than a month out. 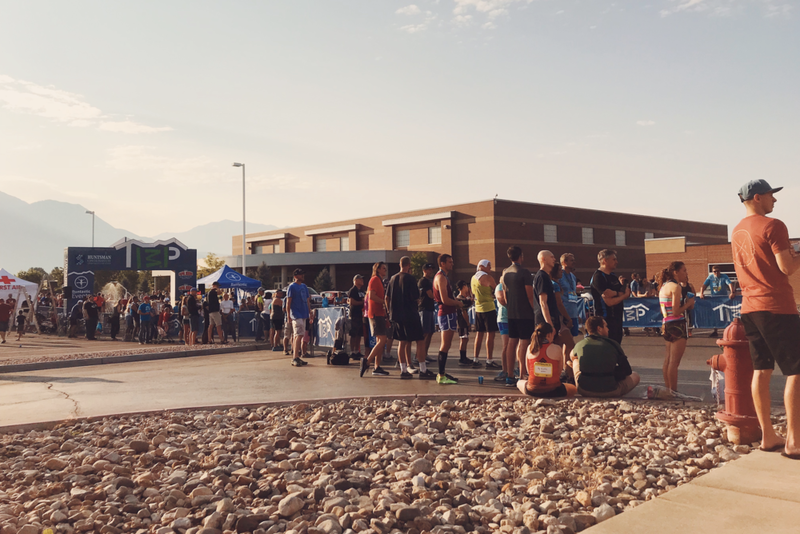 On the day of the race—Saturday, July 28th—I woke up early at 3 a.m., ate breakfast and Geof (and Izzy pup) drove me to the bus boarding area at American Fork High School, which was about a forty minute drive away from home. I boarded the bus around 4:20 a.m. and arrived at the start at Tibble Fork Reservoir at 4:50 a.m. It was pretty dark out and there was a yoga session going on to warm up runners for the race. I felt a bit tired so I didn't partake, but instead, sat on the concrete, took a bathroom break, dropped off my gear check bag and waited for the race to begin. The race started at 6 a.m. and it was just starting to get light out. It was the prettiest running down the canyon, with the most spectacular views of the mountains and pine trees, combined with scent of the dewy morning. I just admired the scenery and wished I had my phone so I could take photos. The first 7.5 miles were all down American Fork Canyon and it was perfect—a little bit of a breeze and no sun. I felt good and with the downhill, it was easy to do fast miles. It felt like this portion whizzed by. I have been doing more trail running and not so much road, so I had no idea how my legs would respond to a road race, but they did just fine! After the canyon, the course leveled out and transitioned to paved trails and neighborhoods. There were flatter sections with rolling hills (and a small stretch with sprinklers blasting, which was fun to run through!). I had never run this course before and liked not knowing where the next turn would take me. I kind of just zoned out until the end and tried to focus on keeping my legs moving at a comfortably quick pace. Once again, going into this race, I didn't have a true time goal in mind, but went into it wanting to run what felt good to me that day. I felt relaxed and happy to be there. It got more warm and sunny near the end but I was determined to keep up my pace. I picked it up in the last mile and as I was getting closer to the finish, I could hear the music and crowds. That always puts more pep in my step! A few more turns and I was back at American Fork High School and could see the finish ahead. While running down the chute, I heard someone yell "Go Val!" and that made me so happy. I found out later it was Kelsey (a fellow runner and one of my favorite people that visits the store). I crossed the finish line with a new half marathon PR by almost three minutes. Final chip time—1:41:45. I loved this whole race. I felt good about being able to keep a consistent pace throughout and pushing when I was getting tired. With harder efforts, I don't usually enjoy eating right after, so I only had some water and electrolytes at the finish, retrieved my gear bag, watched some more runners come in and met back up with Geof and Izzy. I lined up at the results station to print out my official results (where I found out my chip time and that I was 9th out of 102 in my age group!). Here's Izzy barking at another dog she just spotted. She thinks she's the boss of everyone (haha). Though I've been loving trail running more and want to get into more trail races, I would run the Timpanogos Half again. I think a road race is super good to work on your speed and see your improvement. I also loved the weather. 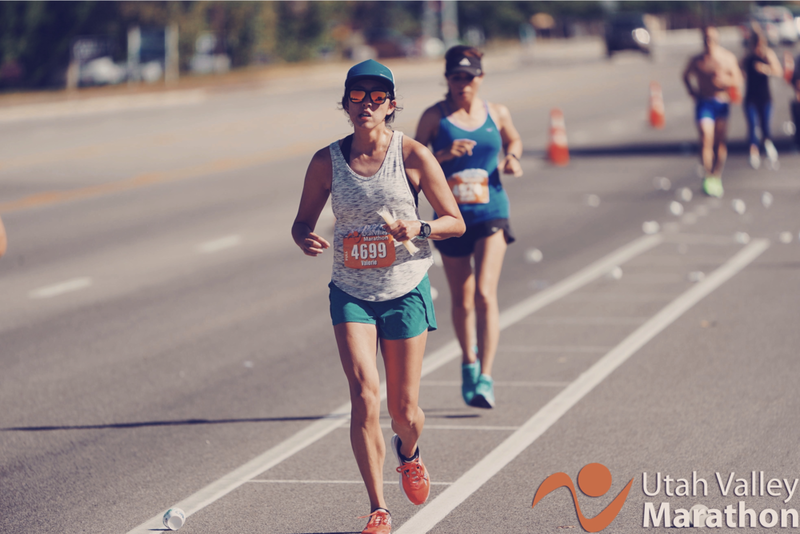 Since the race was so early, the temperatures remained in the 60°s and 70°s the entire run (the crisp air and coolness of the canyon in the summer was the best!). The race was also organized so well! What are your favorite road races? 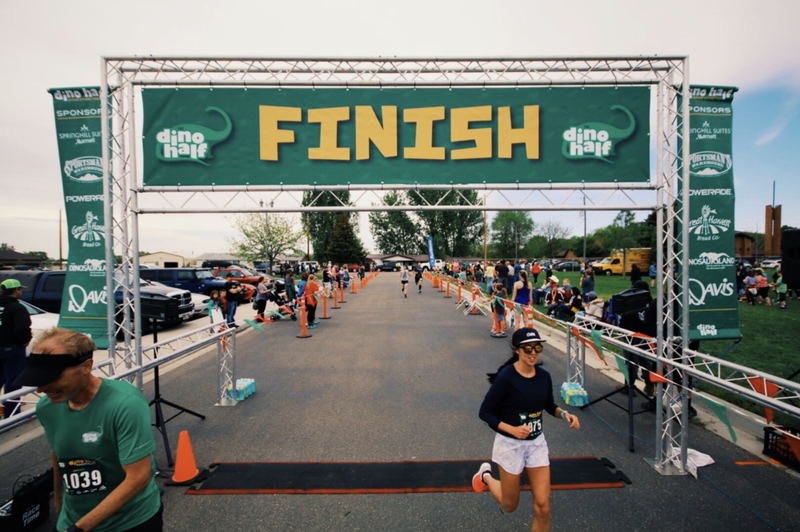 On Saturday, May 12th, I ran the Dino Half Marathon in Vernal, Utah for the fourth year in a row. This was my favorite year that I've ran it. I ended up running a new PR but that's not why I liked it so much. This year's race was my favorite because it showed me that by enjoying myself and believing in myself, I can accomplish great things. I had my best run ever. Let's start back on Friday though. On Friday afternoon, Geof and I made the three-hour drive to Vernal, checked into the hotel (the same one that packet pickup was at) and got our race packets. We headed out for dinner at Antica Forma, a pizza and pasta restaurant. I had the same meal as last year, the linguine with tomato sauce and it was the perfect carb meal for before the race. We went back to the hotel and I gathered up my gear and got in bed to rest. 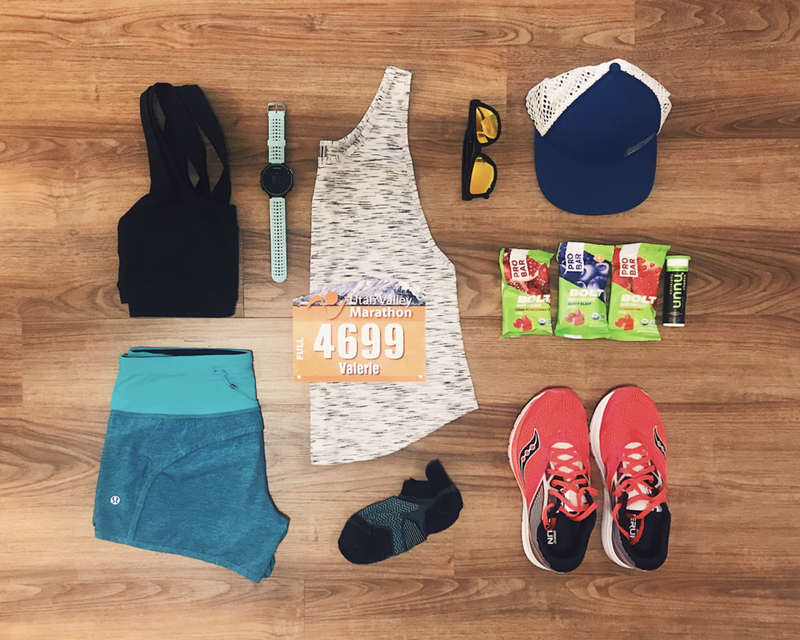 Race day gear. I was originally planning on wearing the race t-shirt but changed my mind the morning of and wore a long-sleeve shirt instead. Nothing new on race day, right?! On the morning of the race, I ate avocado toast in bed and drank a glass of nuun energy. I have the hardest time getting up on race mornings, so I always end up eating breakfast in bed. Once I'm dressed though, I'm ready to race! We left the hotel at 6 a.m., drove to the bus pick-up at Maeser Elementary and boarded the bus to take us to the start. The start of the race is in Dry Fork Canyon and once dropped off there, we got in the port-a-pottie line, gathered around the fire pit and did a little warm-up in the canyon. I immediately felt the tiredness in my legs and wasn't sure what to expect for the race. We lined up for the start and I kept moving my legs in place to stay warm. They began the countdown and the race began promptly at 7:30 a.m. We sped off running down the canyon. The weather? Perfect. Overcast and cool. It was in the 40°s for most of the race and then got into the low 50°s by the end. There was cloud cover the whole time. It was pretty close to ideal race conditions for me. I run warm so I always appreciate a colder race. As I've been doing with races lately, I went in with zero expectations or time goals and really do think that’s what I have to do always. It helps me not stress or worry and makes me focus more on enjoying the run, and then I happen to perform better! Geof decided he wanted to try and run a PR so he ran ahead pretty quickly in the first mile and I was on my own. I don't mind it though. Running by myself is one of my favorite things and gives me space to be in my own thoughts and I love that. I made sure to appreciate the surroundings and views. There were times in the canyon when I just looked around at the trees and scenery and it was pretty magical. I felt grateful for being able to run in such a beautiful place on such a beautiful day. I felt I was running really smoothly and the miles breezed by. At mile 8, I heard a voice behind me say "you're doing good, young lady!" It was a guy named Dale and I ended up running with him for the next mile. He told me I was on pace for a 1:44 to 1:45 finish and I thought that was too good to be true. He asked what my goal was for the race and I said I didn’t have one but that my best half was 1:48. Once he told me what finish time I was on track for, I really thought I could beat my existing PR and that idea began to run through my mind. I decided to go for it. I walked through a water station at mile 9 so Dale ran ahead but I could see him in the near distance and just tried to keep him in sight for the rest of the race. I realized that I had barely looked at my watch until that moment. My race so far had been run going by effort and feel. I occasionally would glance down as my watch beeped for each mile but for the most part, I felt comfortable with doing what felt like a good effort to me. With the course being more downhill at the beginning, it really contributes to a fast start. The miles level out as you get further in the course. My legs were starting to get more fatigued in the final miles and I just pushed and pushed. It was getting harder to keep my legs moving as fast but I made them do it. I was determined. With less than a mile to go, the 1:45 pacer came up on me. He told me I was doing great and I remember telling him I was tired. He said he was planning to run a 1:44:30 finish and that made me extra motivated to stay with him. Another girl came up on us and ran with us for the last half mile. I listened to them chat for a little because I was breathing harder and didn’t feel like talking (haha). We turned the last major corner at 12.7 miles and I could hear the crowd at the finish. We were getting close. We picked it up in the last 0.3 miles and the girl began to run ahead and so did I. There was one last turn to the finish line in the school parking lot and I ran it in! When I crossed the line, I almost couldn't believe it. I had no idea I could run that pace for that long! I surprised myself. Final chip time—1:44:21. I found Geof at the results area. He ended up running a PR of 1:36:28 (yay!). I printed off my official result and saw the 1:44:21 and was so happy about that time that I didn't even realize the paper said I had placed in my age group! Geof pointed that out to me and I was SO shocked and SO excited. We took some photos and waited around for the award ceremony. Dale saw me in the crowd and asked how I did. He congratulated me and I told him it was because I kept him in sight the whole rest of the race and that helped me. He ended up first in his age group (M60-69). I ended up getting second in my age group (F30-34) and the girl I ran the final half mile with was first in our age group! We were six seconds apart. So funny. We laughed about it on stage when we both realized it. I don’t even know how to summarize how I felt about this race because I was so stunned, so proud, so happy. Afterwards, we went back to the hotel to clean up and check out. We ate sandwiches and fries at Freddy's and made the drive back to Salt Lake City to reunite with Izzy pup. Next up: Utah Valley Marathon. It's less than three weeks away and I still don't feel fully prepared. My goal has always been to run this race in under 4 hours. I'm not sure if that's possible as I haven't been consistent with marathon-specific training, but I'm going to go into it with a positive mindset and be happy with whatever my body wants to run that day.